With a new year comes a new set of resolutions, including the resolution to eat healthier and lose weight. It’s not enough to just eat less food, as you also need to ensure your body is getting the proper vitamins and nutrients your body craves. A juicer will allow you to get micronutrients from your fruits and vegetables that you can’t get from cooking them. If you’re looking to get the maximum amount of vitamins and nutrients from your food, then you need a manual juicer. A manual juicer is a device powered by your own muscle that provides significantly more nutrients than an electric juicer. Instead of electricity, manual juicers typically use a crank or lever that requires physical exertion to move. Because there is no electric motor, a manual juicer is a silent device that you can use in the dead of night without waking up your family. Manual juicers are easy to travel with, ensuring that you continue to drink healthy while on vacation. Because they forego electricity, manual juicers are also significantly cheaper than electric juicers. Lastly, manual juicers are much easier to clean as there are less moving parts. While a manual juicer is the best way to ensure you’re getting the maximum amount of nutrients, the device does have some drawbacks. Some manual juicers struggle with vegetables with hard outer shells, and even vegetables with softer shells will still require a herculean amount of strength to process. It also takes almost five times the amount of time to make juice when using a manual juicer over an electric one. If you’re ready to dive into the world of fresh juice, then you’ll need a manual juicer of your very own. While there are hundreds to choose from, we’ve compiled ten of the best juicers on the market today. Each of these manual juicers will provide you with a delicious glass of juice that is full of nutrients and vitamins. With a little bit of muscle on your end, the Lexen GP27 Original Healthy Juicer can strain nearly any fruit or vegetable, even ones that you can’t typically juice when using a manual juicer. You can turn everything from kale and spinach to wheatgrass and collard greens into a refreshing juice with the Lexen GP27 Original Healthy Juicer. The Lexen GP27 Original Healthy Juicer is easy to use, making it ideal for a novice. Just put the fruits and vegetables in, turn the crank and you’ll experience delicious juice in only a few minutes. The Lexen GP27 Original Healthy Juicer also takes only 30 seconds to clean up once you become familiar with the inner workings of the device. The Lexen GP27 Original Healthy Juicer includes both a suction base and a table clamp so you can attach the juicer to nearly any surface. One of the best drinks in the world is a fresh glass of citrus juice, such as orange juice or lemonade. If you’re looking for a manual juicer to make primarily citrus drinks, then you’ll love the E4U Fresh Citrus Juicer. 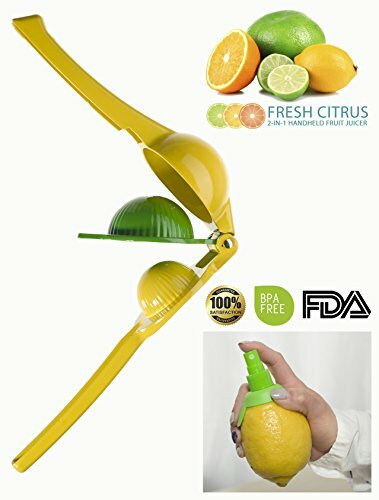 The E4U Fresh Citrus Juicer is a handheld juicer that gives you the power of a large commercial juicer right in the palm of your hand. The die-cast aluminum body gives you all the strength of a stainless steel frame but with half the weight, which makes the E4U Fresh Citrus Juicer a perfect travel companion. The design of the E4U Fresh Citrus Juicer allows you to extract just the juice without any rind, seeds or pulp infiltrating your glass. If you’re looking for a citrus juicer with a bit more stability, then you’ll want to try the Switol Pro Juice Press Extractor. The Switol Pro Juice Press Extractor features a thick steel base that ensures it won’t slide around on your counter while you try to make juice. The long handle gives you extra stability, allowing you to squeeze out every last drop of juice from any pomegranate, grapefruit or lemon. The pulp is left in the strainer, leaving you with a delicious glass of citrus juice that goes down smooth. The Chef’s Star Manual Hand Crank Single Auger Juicer is a manual juicer that gets you a cup of delicious juice in just one simple step. This manual juicer uses a strong suction base that allows you to attach it to any surface. The suction base leaves no lasting residue or damage, making this juicer safe to use on even vintage furniture. All of the parts in this juicer are detachable, making it easy and quick to clean up. 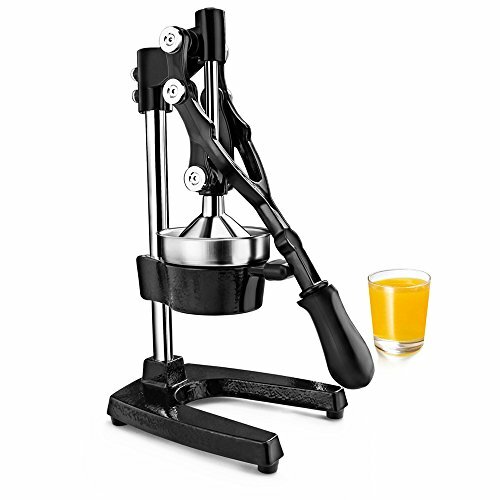 The design of the Chef’s Star Manual Hand Crank Single Auger Juicer ensures that you’re getting the maximum amount of juice from your fruits and vegetables, and the built-in strainer will separate the juice from the pulp. While other citrus juicers use plastic or aluminum, the OVOS Citrus Juicer uses 100 percent stainless steel. In fact, OVOS claims that this juicer is unbreakable and will not rust or bend. 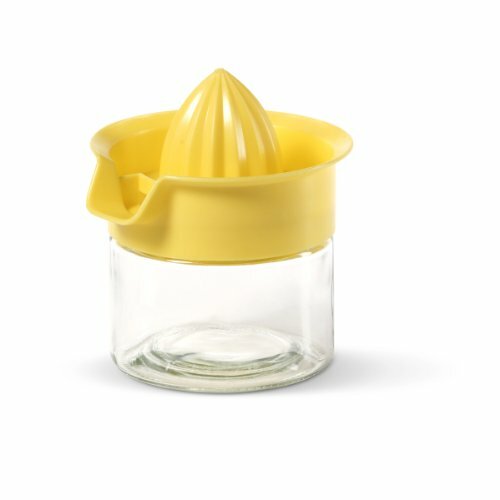 The OVOS Citrus Juicer can fill an entire glass with juice in under a minute thanks to the long handle which lets you get a tighter squeeze. The large size of the OVOS Citrus Juicer will ensure that even the biggest lemon or orange can fit into the juicer with no issues. The ergonomic design of the OVOS Citrus Juicer will keep your hand and wrist feeling great no matter how many cups of juice you need to make. The New Star Foodservice Commercial Citrus Juicer is a high-quality manual juicer that often found in restaurants, hotels and other establishments that serve juice. It’s easy to see why the New Star Foodservice Commercial Citrus Juicer is so popular in the food and hospitality industry, as this manual juicer can make a delicious cup of orange juice in under 30 seconds. The rubberized handle is easy to grip and will not result in any hand or wrist injuries even after prolonged use. The device itself is made of cast iron, ensuring that it will last for years to come. The New Star Foodservice Commercial Citrus Juicer combines both a massive base with a suction cup to guarantee that this manual juicer stays in one spot while you use it. 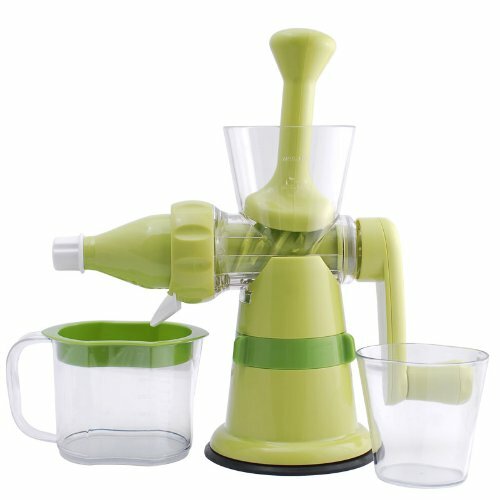 The Kitchen Kraft Large Manual Commercial Juicer is a high-quality commercial manual juicer that is brimming with power. This manual juicer features a long handle and a powerful pull-down mechanism to ensure that you’re getting the maximum amount of juice from anything you put into it. 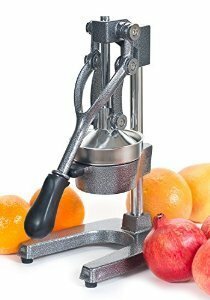 The Kitchen Kraft Large Manual Commercial Juicer can juice a large number of fruits and vegetables, including apples, lemons, pomegranates and grapefruit. The heavy base on this juicer provides extra stability on any surface. The high-quality materials used in the Kitchen Kraft Large Manual Commercial Juicer will ensure that it lasts for decades. The Gemco 12-Ounce Juicer takes manual juicing back to the basics. 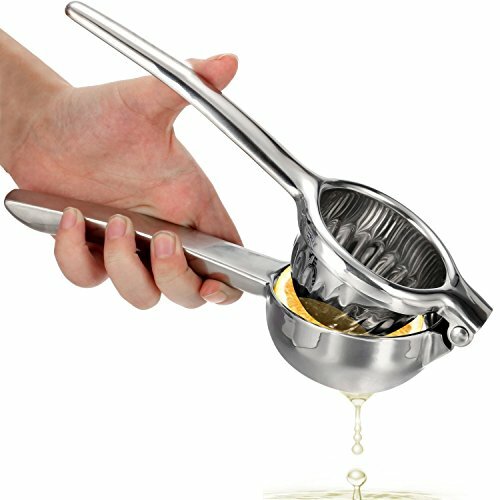 This manual juicer attaches to any cookware in your kitchen using a safe, nonstick material. Once attached, you’ll use the flexible head on the top to manually scoop and scrape out the juice from any fruit, just like your grandmother used to do. The Gemco 12-Ounce Juicer is even safe for the oven, as this juicer is resistant to temperatures of up to 500 degrees Fahrenheit. The Gemco 12-Ounce Juicer is also dishwasher safe, making cleaning up as simple as throwing it in your dishwasher with the rest of the dirty dishes. The Jupiter Large Commercial Juice Press is one of the more expensive manual juicers on the market today; however, with its high price tag comes high-quality materials and features. This manual juicer is a combination of cast iron and 18/10 stainless steel, meaning that it’s both durable and up to the task of juicing any fruit or vegetable. The extra-long handle gives you extra stability for tougher fruits and vegetables while the thick base ensures the juicer won’t topple over while in use. 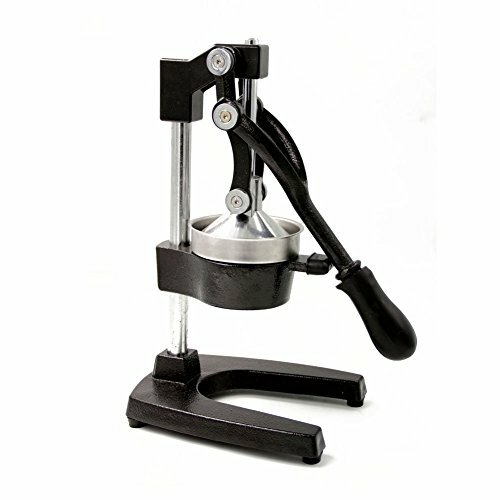 The rubberized handle can withstand 2,300 PSI, making this juicer a perfect fit for bodybuilders and other muscled athletes. With its sleek silver and black body, the Lexan Healthy Juicer exudes style. However, this manual juicer has more going for it than just good looks, as it includes a wide array of features. 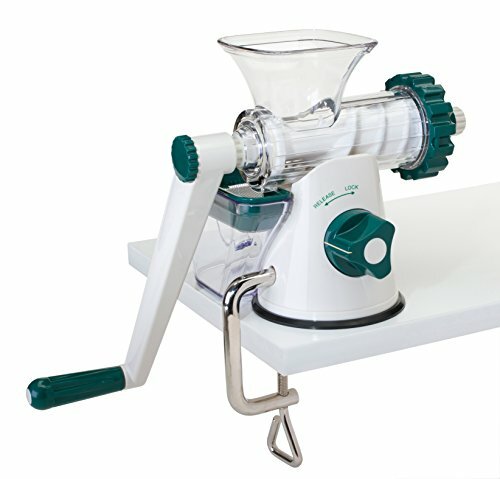 Like other Lexan models, the Lexan Healthy Juicer features both a suction cup base and a table clamp. In addition to fruits and vegetables like apples, oranges and grapefruit, the Lexan Healthy Juicer can juice wheatgrass, spinach and lettuce. The stainless steel construction both looks good and helps make the Lexan Healthy Juicer a tool that will last for years. 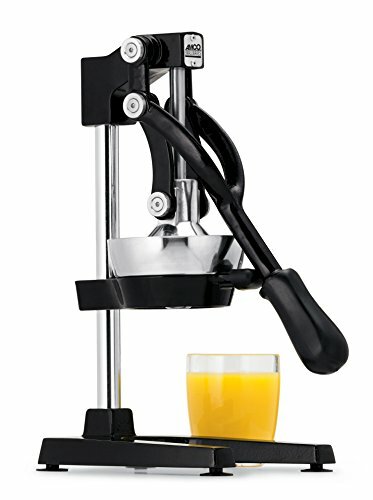 The 10-inch handle on this juicer requires less exertion to turn than other manual juicers.